start-ups and industry leaders engaged. 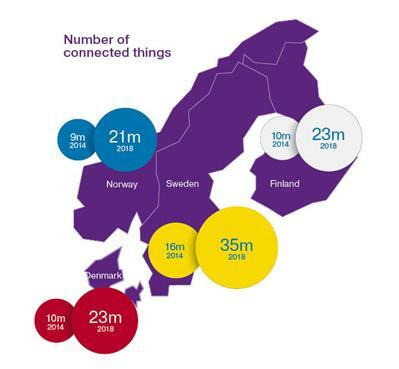 Nordic countries are leading the way in the Internet of Things, the latest ‘Connected things’ study by TeliaSonera shows. There will be ~4 connected devices per person in the Nordics by 2018, Gartner Inc. predicts. Currently the Scandinavian region has 4 times as many connected “things” per person as the rest of the world. The TeliaSonera report forecasts the Nordic market for IoT devices will grow by 23% annually, to €9.1bn by 2018: with Sweden placed first, Norway and Denmark – placed 2nd and 3rd, and followed by Finland. Connected vehicles, connected building and connected people are the three driving forces for developments in connected cars, smart homes and digital health. The fastest growing segment of IoT in Scandinavia is ‘connected people’ which includes not only people, but also animals. The market for connected people is expected to grow by 59% annually until 2018. ‘Connected vehicles’ (anything that transports passengers or cargo) sector is forecast to increase by 36% annually. ‘Connected buildings’ sector is expected to grow by 23% annually until 2018, when there will be, on average, 3 connected building devices, such as security, energy and HVAC, per household in the Nordics. From the business prospective, Elbak pointed out that “very few [companies] acknowledge the business transformation opportunities” – or how to best make use of the vast amounts of data ‘connected devices’ generate to enable intelligent decision making, research and development and predictive services. In the study by Accenture the Nordics are placed among the countries with the most conducive environment for Industrial IoT, along with the US, Switzerland and the Netherlands; while China, Japan, and Germany are just mid-table performers. 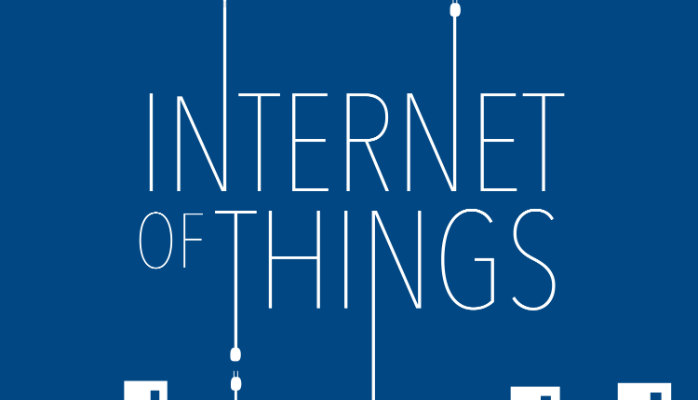 Recently in the Scandinavian region there have been several promising practical initiatives in the field of IoT, on radar both in start-ups and industry leaders. In Norway, Nornir’s ‘smart home’ project addresses the expected elderly boom problem by providing the opportunity for them to live at home. The smart home environment accommodates intelligent sensors that monitor changes in the environment and the security system which recognises individualized patterns deviations and gives instant alerts to the ‘stakeholders’ if smth happens out of the ordinary. Also one of the first worldwide real-time data linking systems is being implemented in Norway by Synaptic Technologies, and their Real Time Web (RTW) ambitiously strives to be a world-wide open platform for everybody to share and exchange readable or writable machine data online and for intelligent objects to be connected. In Sweden, the startup Automile is tapping into telematics and untraditional cloud-powered fleet management. CEO Jens Nylander explained old legacy solutions typically require quite expensive physical installations and modifications to the car – meaning dependency on retailers and installers. Targeting primarily at smaller business, Automile operates on a SaaS model where the device itself is free and users pay a subscription fee. Interesting that big names like ABB and Ricoh International are now among the customers. Thingsquare, Swedish IoT pioneer, provides the software platform allowing you to connect all your products with smartphones wirelessly. Also the Swedish car manufacturer Volvo has introduced a cloud-based communications system for road safety: the tech is piloted in Sweden and Norway, where weather conditions can be suitably extreme, and it’s hoped the system will be standard in Scandinavia already in 2016 and is even a part of the governmental program. The Swedish multinational provider of communications Ericsson recognises “Networked Society” as its core directive to align with IoT thinking aiming at connecting 50 billion devices by 2020; all in order to benefit its subscribers. In Finland the IoT initiative is represented by BaseN Platform – a highly scalable and easily distributed IoT platform, enabling required scalability for hosting millions of things. These are just a few interesting starts, still many more to mention are: from Sweden – Yanzi Networks, one of Intel’s innovation labs, Imagimob with Artificial Intelligence innovation for torso body tracking through embedded, wearables and mobile devices, Connode with unique position in Smart Metering Market, Springworks known for its machine-to-humanity (M2H) connectivity innovaton, FarmDrones with a connected solution for farmers to increase productivity and crops yield, Watty with the next generation energy product, Ewa Home, hidn Tempo, Minalyze; from Norway – Nordic (Semiconductor); from Finland – CyberLightning with its Smart city concept at the industrial scale, etc. Have more interesting examples, or wish to share your point of view? You are welcome to leave your comment here. Previous postEffective BI Systems. How to choose an effective BI strategy?